Entering a recipe contest is so exciting. eRecipeCards has challenged eight of us to come up with a winning recipe using products from O OLIVE OIL. I received my box of Blood Orange Olive Oil and O Porto Vinegar a few weeks ago. I have seasoned cornish hens with the oil and vinegar, I have added them to green beans wrapped in bacon, and dressed salad greens with them. This combo of olive oil and vinegar could be the secret ingredient that makes so many of your recipes outstanding. Many restaurants are now using O’s olive oils and vinegars as finishing touches to their dishes. There are so many possibilities for their use, and I am thrilled to be a part of this contest. The hardest part has been settling on a recipe to share for the contest. If you have been following my blog you know that I love seasonal ingredients. The sweet potatoes in the market right now are near perfection. Oranges and sweet potatoes go well together. But I was looking for a dish with a little spice. The Porto Vinegar has a slightly smoky taste which marries well with spices like cumin and chili powder. 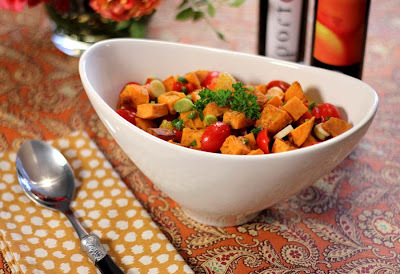 So I roasted cubed sweet potatoes tossed with blood orange oil, porto vinegar, and the spices. I made a salsa with the roasted potatoes by adding tomatoes, orange segments, jalapenos, scallions, and cilantro. A vinaigrette of orange juice combined with the orange oil and vinegar was the finsihing touch. 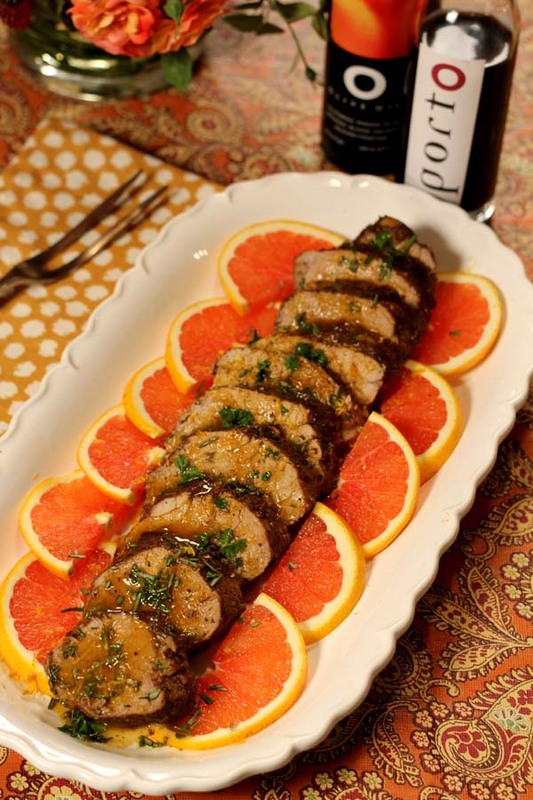 One of my favorite meats is pork tenderloin. It is mild in taste and marries well with other flavors. It is a perfect complement to the sweet potatoes and the oil and vinegar. A simple spice rub was added to the tenderloins and they were browned and roasted in the oven for a short time. I made an orange sauce to drizzle over the finished dish. Served with the sweet potato salsa it is an awesome combination with a little kick. What could be prettier or more colorful going into the holiday season? Mix spice rub ingredients together. Rub all but 1 teaspoon of the spices on the trimmed pork tenderloins. Place the tenderloins in a glass dish that will hold them. Cover and marinate in the refrigerator for at least two hours. Preheat oven to 350 degrees F. Remove tenderloins from the refrigerator. Heat 1 tablespoon of oil in an iron skillet or large frying pan. Add the tenderloins and brown on all sides. Pour wine into skillet and cook briefly. Cover pan and place in oven and roast pork for 20 to 30 minutes. In the meantime, heat the orange juice, Blood Orange Oilve Oil and Porto Vinegar together in a small saucepan. Add the honey and the 1 teaspoon of reserved spice rub and cook over low heat until everything is combined. Salt if needed. Combine the cornstarch and water to create a slurry. Add it to the orange sauce and cook stirring constantly until the sauce thinckens slightly and becomes glossy. Reserve. Remove tenderloins from oven and place on a cutting board. Let rest covered for 10 minutes. Slice and serve with sauce and salsa. Preheat oven to 375 degrees F. Place cubed sweet potatoes on a rimmed baking sheet. Drizzle with 3 tablespoons of Blood Orange oil and 1 tablespoons of extra virgin olive oil. Drizzle with 1 tablespoons of Porto Vinegar. Toss together to coat well. Sprinkle with spices and salt and pepper and toss again. Roast in oven for 30 to 45 minutes, tossing occasionally until sweet potatoes are tender and beginning to brown. Remove to a large bowl. Add all of the chopped fruit and vegetables and the orange zest and stir to combine. Mix the orange juice with the remaining 1 tablespoon of Blood Orange Oil and the remaining 1/2 tablespoon of Porto Vinegar. Pour over the salsa. Sprinkle with cilantro and additional salt and pepper if needed. Stir to combine. Serve warm or at room temperature. Now it is your turn to vote. Do you think I have a winning recipe? I hope so. I know I will have stiff competition. These ladies are the best. I would appreciate your support. Just go to the eRecipeCards home page and follow the links to the search recipes page. Enter OOLIVEOIL in the search box. This will take you to the list of competitors. 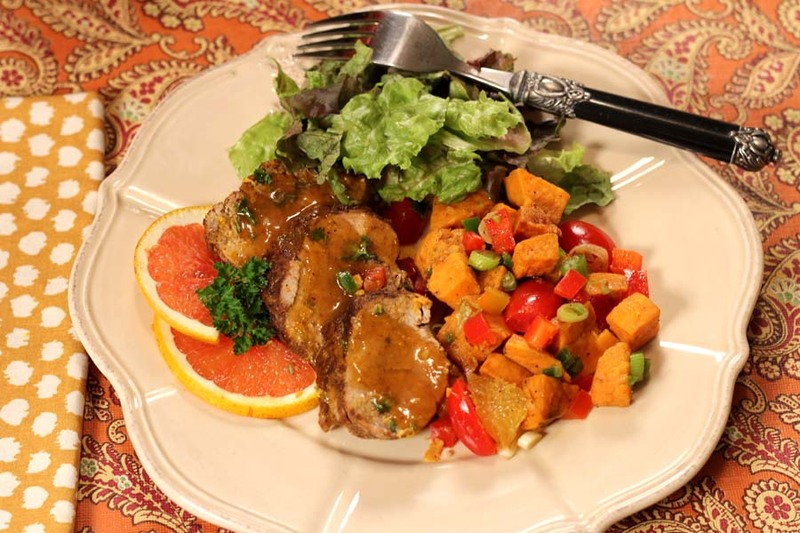 Add my pork tenderloin recipe to your recipe box. Also add my taste testing recipe. You do need to be a registered member of eRecipeCards. If you are not a registered member, it is easy to join and there are no requirements other than filling out the registration form. eRecipeCards is a great resource. Dave has provided bloggers and non bloggers alike with a site where good food and terrific recipes abound. Posted on December 1, 2011 at 4:26 am.